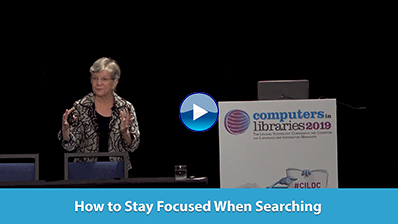 WebSearch University provides a unique opportunity to connect with some of the best-known power searchers on the planet. In a collaborative learning environment, you will learn how to surface information from the deep web, when to abandon the free web for a different source, why to use one tactic over another, and how to turn information overload into actionable information. This is a crucial time for the Special Libraries Association (SLA). Founded in 1909 by John Cotton Dana, SLA is in the midst of an identity crisis. With declining membership and diminishing revenue, the association is grappling with what its future will be, and the departure of CEO Janice Lachance at the end of 2014 sparked a discussion about the best way forward. Innovative introduced the Output Data for Libhub Service, a solution that simplifies libraries' publication of linked data records and allows them to easily contribute to the Libhub Initiative. It extracts the records from the database of any Innovative ILS or services platform (such as Sierra, Polaris ILS, Virtua, or Millennium) and formats them in MARC/XML. The American Psychological Association (APA) teamed up with ReadCube to index its scholarly journal and book collections in ReadCube Discover, including all 110 titles in the PsycARTICLES database and more than 65,000 books and book chapters from PsycBOOKS. EBSCO Information Services expanded its partnership with The H.W. Wilson Foundation to enhance searching for electronic theses and dissertations (ETDs). The foundation will support the expansion of American Doctoral Dissertations, 1933-1955, a free database that debuted in 2014, to include records of ETDs from 1955 to the present. NISO (National Information Standards Organization) published a new recommended practice, Protocol for Exchanging Serial Content (PESC). It suggests the best way to manage digital serial content packaging elements to help content providers and content recipients track what was delivered and received. ProQuest announced that version 2 of Intota, its cloud-based library services platform, will be available in mid-2016. The company demonstrated the updated version's functionality at the recent American Library Association (ALA) annual conference. For authors who want to self-publish their books, the public library may be the best place to find services that can help. One such place is the Seattle Public Library (SPL), which offers a variety of self-publishing initiatives. David Christensen, virtual and instruction services librarian, has been part of the team managing these initiatives since 2013. Don't try to replicate other libraries' self-publishing programs, which may not be a good fit with yours, he says. "Start small and figure out what works well for you." Want to review some articles from our library publications? Download the free June content sampler (PDF) of recent articles and an exclusive offer for a free book with a subscription to Computers in Libraries magazine.